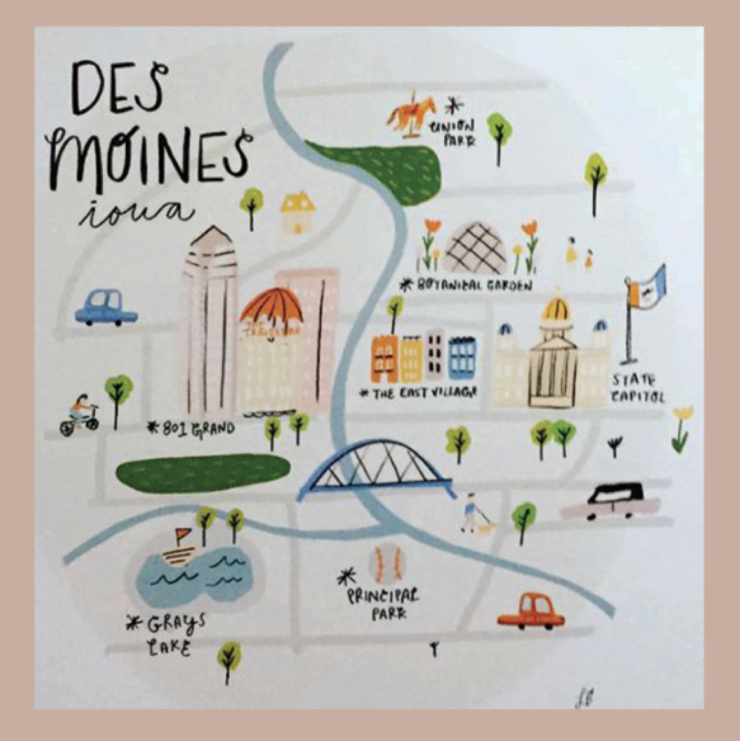 Illustration of Des Moines by local artist Libby Burns. Libby Burns can now solidly add ‘local Des Moines artist’ to her resume. Getting ‘local’ was a winding road for Burns, who was born and raised in the D.C. area, educated in Missouri, then landed in Iowa’s capital city by way of a graphic design job opportunity. If working by day as a designer for Drake University communications or buying her first Beaverdale brick didn’t establish her already as ‘Des Moines local’, Burns has now been selected by retail décor giant West Elm as one of their featured LOCAL artists. She, along with other central Iowa artisans, can been found selling their art and design wares at the chain’s newest branch which opened last week in the Des Moines East Village. “I moved here to take a job and I had no idea what to expect out of Des Moines,” said Burns, “but I can now say that moving here was one of the best things I have ever done. This is a fun community of supportive, enthusiastic, inclusive creative people here working in the arts, and it’s been a great place to move my freelance illustration business forward.” West Elm works with local artists in the communities they build in. Locally made furniture, paintings, textiles, graphics, pottery, and other items are selected and then sold in the chain’s retail space. Their site describes the store as ‘focused on the intersection of modern design, affordability and community’, and West Elm prides themselves on organic, handcrafted, sustainably sourced and Fair Trade Certified products. “I am so stoked to be one of seven West Elm Local artists selected for the new store!” exclaimed Burns. • Community – by supporting local artists West Elm helps to keep American crafting alive. In 2013 the chain began the new practice of featuring LOCAL artists in just two of their retail stores. Today there are more than 85 stores participating in the program selling over 6000 locally created household products. The chain’s goal is to have 1000 featured LOCAL artists by the year 2020. Burns creates prints, cards, books and buttons just to name a few of her products. She has participated as a vendor in Market Day, and shown original work in the PedalArt show at the Des Moines Social Club. She has also been featured in a number of publications such as Northern Virginia Magazine, Bethesda Magazine, Arlington Magazine, San Diego Magazine, Illustrated Ladies, TheKitchn.com, Vox Magazine, Women Who Draw, Amelia’s Magazine, Drake University’s Blue Magazine, and Maker’s Magazine. 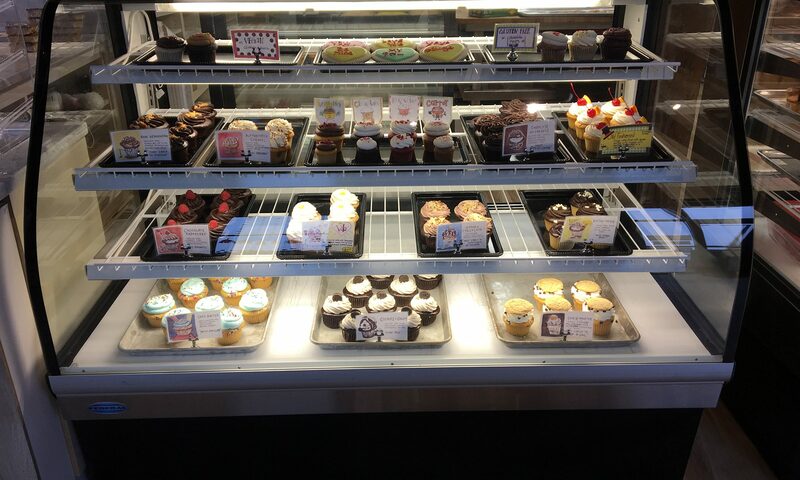 The Des Moines’ art scene is lucky to call Libby local! Want to buy Libby’s art? Shop for Libby’s designs at Libby Burns Design. Next PostNext Did You Know Your Neighbor is World Class?